Many municipalities utilize end-to-end (manhole-to-manhole) sewer rehab methods by default, but this can waste time and money. 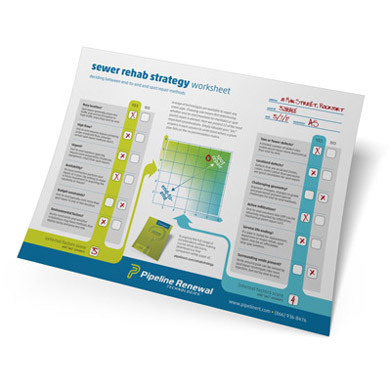 Our new Sewer Rehab Strategy Worksheet helps you make an informed decision between end-to-end rehab and spot (point) repair alternatives. It presents major considerations as a series of yes-no questions and offers a quick, clear way to turn your answers into an action plan. Download your FREE printable copy today. ©2017 Pipeline Renewal Technologies LLC. All rights reserved. Specifications subject to change without notice.